The CSU Module 1 video sessions are also available for download on Vimeo On Demand which can be accessed on your tablet, phone, computer, apple TV, and Roku devices. The purpose of this Cleansing Stream University training is not only to prepare you to minister effectively to others whom the Lord places in your path, but also to teach us how to position our own hearts before the Lord to allow Him to do a refining work in us. As we look specifically at the purpose of this session, Preparing to Minister, we’ll focus on the importance of our own intimacy with the Father. 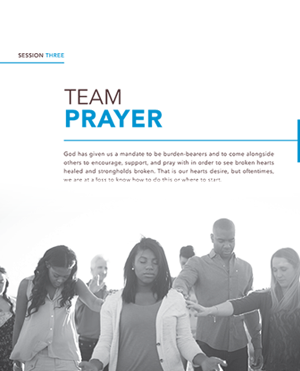 To help us do that, we will look at three specific parts that contribute to a growing intimate relationship with God. 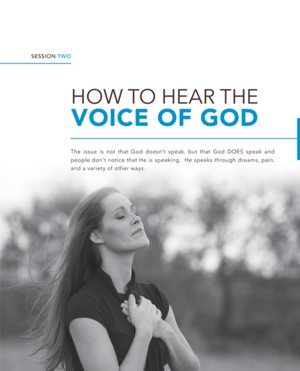 The issue is not that God doesn’t speak, but that God DOES speak and people don’t notice that He is speaking. He speaks through dreams, pain, and a variety of other ways. 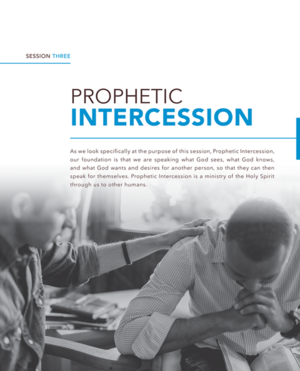 As we look specifically at the purpose of this session, Prophetic Intercession, our foundation is that we are speaking what God sees, what God knows, and what God wants and desires for another person, so that they can then speak for themselves. Prophetic Intercession is a ministry of the Holy Spirit through us to other humans. 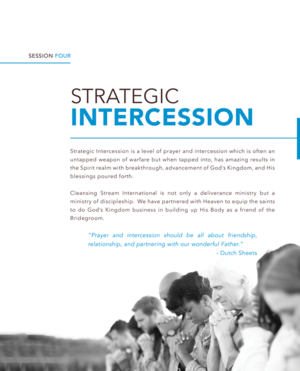 Strategic Intercession is a level of prayer and intercession which is often an untapped weapon of warfare but when tapped into, has amazing results in the Spirit realm with breakthrough, advancement of God’s Kingdom, and His blessings poured forth. The CSU Module 2 video sessions are also available for download on Vimeo On Demand which can be accessed on your tablet, phone, computer, Apple TV, and Roku devices. For many of us, we know that forgiveness is important, but we tend to justify it according to our circumstances. 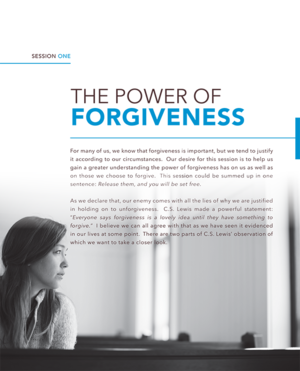 Our desire for this session is to help us gain a greater understanding the power of forgiveness has on us as well as on those we choose to forgive. This session could be summed up in one sentence: Release them, and you will be set free. 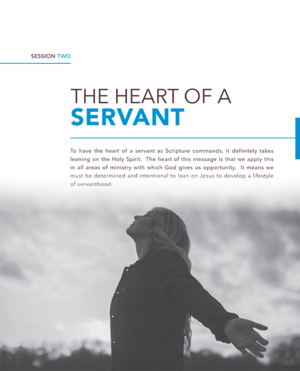 To have the heart of a servant as Scripture commands, it definitely takes leaning on the Holy Spirit. The heart of this message is that we apply this in all areas of ministry with which God gives us opportunity. It means we must be determined and intentional to lean on Jesus to develop a lifestyle of servanthood. The word “Christian” means “Christ-one.” The disciples were identified as being a Christ One, identified with Jesus Christ. As a Christian, you are identified with God, because you believe in the name of Jesus, and His nature and character are to become part of who you are. You are a Christ One. The topic of the blood of Jesus helps us understand the depth of God’s love for humanity. When we come to Christ, it is important for us to understand that we enter into an agreement with Christ. An agreement that is covenant based, meaning one that is not to be broken. As we begin to understand the depths of what is given to us through the blood of Jesus, His blood covenant with us, we gain a new, valuable insight into the eternal gift of salvation God has provided for us. A believer can open doors and give the demonic access and a right to operate in their life, through demonic entry points. A believer can also close these doors through acknowledging the truth, repentance, deliverance. During this session, we will take a look at the 7 most common demonic entry points to help us recognize the symptoms or blockages that may be there, not allowing deliverance and freedom to take place. Our enemy’s plan and desire is to steal, kill, and destroy our lives (John 10:10). He is subtle and crafty in setting up experiences that bring hurt and pain for the purpose of getting us to come into agreement with his lies, which will then lead us to form inner vows. Inner Vows imprison us to act and think exactly in the way those vows have set the mold for us. God has given us a mandate to be burden-bearers and to come alongside others to encourage, support, and pray with in order to see broken hearts healed and strongholds broken. That is our hearts desire, but oftentimes, we are at a loss to know how to do this or where to start. Blessing in Scripture is much more than favor and accumulating of material things. From a biblical position, blessing is simply seeing, speaking, and living from the perspective of God. It is our desire that everyone in the church would benefit by going through the CSU training after the Basic Seminar. It is up to the local Pastor to release you for ministry at Cleansing Stream Events. Who can participate in Cleansing Stream University? What does Cleansing Stream University Module 1 qualify me for? If you start Cleansing Stream University now, you will be able to serve at Cleansing Stream Events as an Intercessor. Those with previous Discipleship experience are qualified to serve as Anointers or Intercessors at Cleansing Stream Events (pending Pastoral approval). How long will a module take to complete? CSU is designed as a study consisting of 4 modules. Each module contains 4 two week sessions. At the completion of each module, a digital certificate will be awarded after a Ministry Impact statement is submitted by the participant. Where can I download the Leader's Guide for Module 1? The CSU Module 1 Leader's Guide can be downloaded here.